Vintage Barbie doll markings are found on the right side buttock, trademark date is first date of patent, copyright in the country of issue. 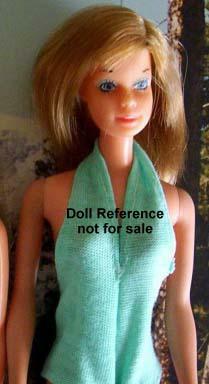 See below for more vintage Barbie dolls 1973-1976 identified and described. 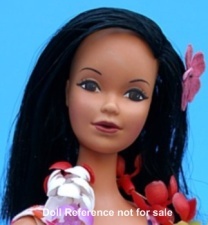 Used the Stacey head mold in 1973-1974, is pink skinned, brown eyes, painted lashes, long straight titian (red) hair, TNT waist, wore a Malibu like blue swimsuit, has straight non-bending legs. These dolls are only found in Europe & Canada. Mark: © 1966 Mattel, Inc. U.S. & Foreign Patented Other Pat's. Pending Made in Korea. In 1975-1976 the Steffie head mold was used for Barbie, she has blue eyes, painted lashes, blonde hair, same Malibu like swimsuit now in yellow, markings same as prior year. Mark: © 1966 Mattel, Inc. U.S. Patented U.S. Pat. Pend. Made in Korea. 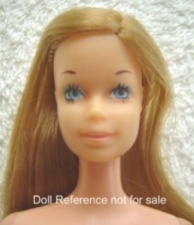 True Barbie head mold, blue painted eyes, painted eyelashes, blonde rooted hair, twit waist, bendable legs. Wore a pink and white checked gown with long sheer white sleeves. Mark: © 1966 Mattel, Inc. U.S. & Foreign Patented Other Pat's. Pending Made in Taiwan. See below - 9217 - Deluxe Quick Curl - Same as the #4220 Barbie Quick Curl but now came with an additional promotional Jergens beauty kit. 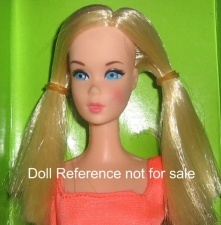 Made from the true Barbie head mold, long Blonde rooted hair, tied in pigtails, non-twist waist, bendable legs, wore a one piece rose colored swimsuit. 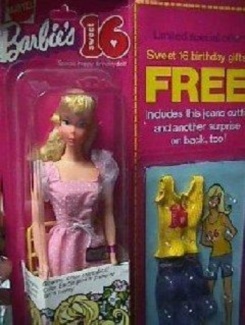 Promotional doll, the Sweet Sixteen Barbie doll has blonde rooted hair in a shag haircut with bangs, blue painted eyes, painted lashes, twist and turn waist, bendable legs, came dressed in a pink and white dot cotton gown, plus blue jean shorts and yellow cotton ribbed tank top with the number Sixteen (16) on front, the later dolls did not have the extra shorts outfit. These dolls were sold in the European market only. 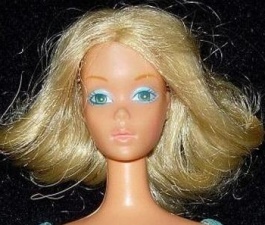 The true Barbie head mold was used, painted blue eyes, painted lashes, long rooted blonde hair in pigtails, pink skin tone, twist waist, bendable legs. She's wearing a one piece swimsuit styled like what the Malibu's wore, in tangerine. Specially constructed with a back tab, when pulled the waist became movable, so the doll could twist, bend, swing a golf club, etc. New golden blonde hair with a part on left, painted blue eyes, painted lashes, bendable legs. Wore a white sun suit with red midriff, matching red print long cotton skirt, tennis racket, golf club, white ball & white tennis shoes, red ribbon hair bow. Mark: © 1967 Mattel, Inc. Taiwan U.S. Pat. Pend. 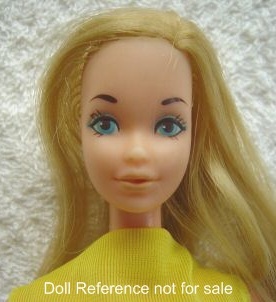 Regular Malibu Barbie with Stacey head mold, sun tanned skin tone, long blonde rooted hair, blue painted eyes, painted eyelashes, twist waist, bendable legs. Wore a one piece red, white and blue swimsuit. Promotional item to tie in with the Olympics. Both of these below dolls used the same Malibu Barbie - Stacey head mold as shown in #7233 Barbie Gold Medal but came with appropriate attire; ie. Skater or Skier outfit. Used the Steffie head mold, brown painted eyes and black lashes, black rooted long hair, came in several prints over the years. The one shown is from 1976 when the Barbie logo was changed to a more modern style. Same as #4220 Barbie Quick Curl but now came with a Jergens beauty kit, true Barbie head mold, blue painted eyes, painted eyelashes, blonde rooted hair, twit waist, bendable legs. came dressed in a blue gown with white fringed stole, white beaded necklace. Mark: © 1966 Mattel, Inc U.S. & Foreign Patented Other Pat's. Pending Made in Taiwan. Uses the Stacey head mold with long straight blonde hair, pink skin, non-bending knees, no twist waist, came dressed in a two piece blue swimsuit. Mark: © 1959 Mattel, Inc. U.S. Patented U.S. Pat. Pend. Made in Korea. Blonde ponytail hair, jointed swivel head & arms, twist waist, special leg construction so doll can do splits & kicks, wore a white tutu with gold trim & white slippers, gold crown, white posing stand, red flower bouquet. Mark: © Mattel, Inc. 1966 U.S. Patent Pending Taiwan. 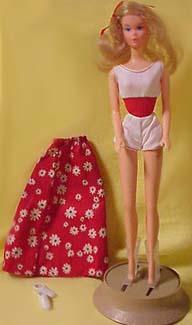 Uses the #9093 Ballerina Barbie doll; Blonde ponytail hair, jointed swivel head & arms, twist waist, special leg construction so doll can do splits & kicks, wore a white tutu and slippers, gold crown, red flower bouquet, plus a Snowflake fairy outfit & a pink practice outfit. See photo of the #9093 ballerina Barbie. Department Store Special, has rooted eyelashes (rooted eyelashes are not used again on the USA Barbie, until 1992) and painted green eyes, bride outfit was also available separately in # 9419 Barbie Fashion Original. 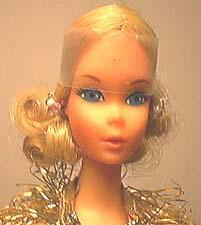 Used the same Malibu Barbie - Stacey head mold shown in #7382 Barbie 1976.